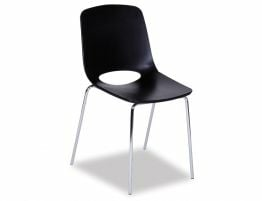 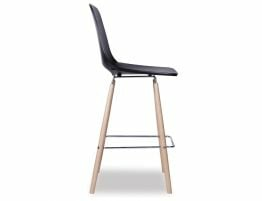 Get the bold, modern look of this black dining chair for your space be it your modern kitchen, casual dining area of café or restaurant. 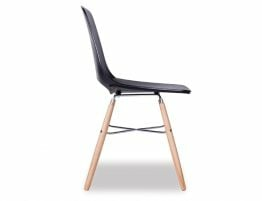 With a nod to the Eames Eiffel chairs, the Wasowsky chair from Spanish designers Enrique Del Amo and Angel Marti offers a perfect balance of “old” modern and new modern giving us a mod black dining chair with a serious design pedigree built tough for your busy dining spaces. This black dining chair features a soft molded seat and back that cradle the body for a comfortable seat. And our contemporary black kitchen chair mixes materials with a techno-polymer seat balanced on beechwood legs. 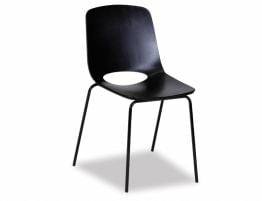 In black, the modern Wasowsky dining chair is versatile, classic and offers the kind of simple, modern minimalism that makes this contemporary black kitchen dining chair a must have. 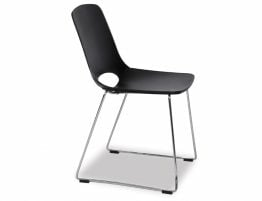 Update your commercial dining chairs or kitchen dining chairs with a fresh, modern chair from Ooland and Spanish design auteurs.